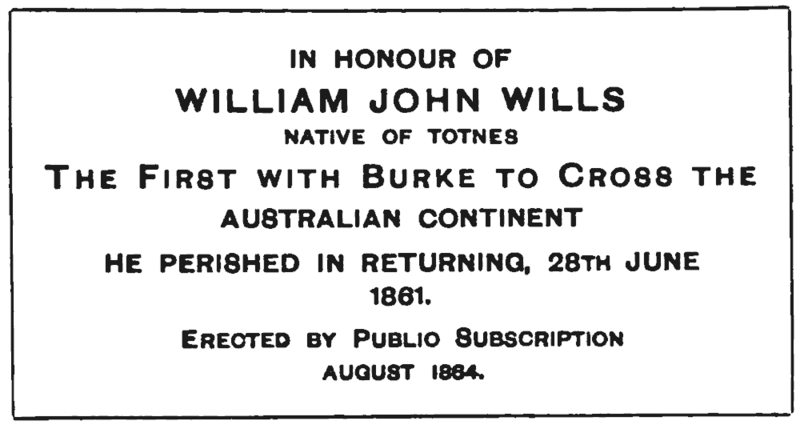 The little town and ancient borough of Totnes has during its lengthened history been the birthplace of men, not a few of whom have made their mark in the world, and not the least of these is one born in the present century – Wills, the Australian explorer – whose name deserves to be enshrined in the Transactions of this Association. * Henry Le Visconte, who was first lieutenant in the Erebus, and perished in the Franklin Expedition, was first cousin to Mrs. Wills. He left school when sixteen and commenced to study medicine in his father’s surgery. In 1852 he studied practical chemistry under Dr. John Stenhouse at St. Bartholomew’s Hospital, who spoke of him as one of his most promising pupils, and ventured the assurance that in two years he would be second to none in England in practical chemistry. In 1852 Dr. Wills determined to join the exodus then pouring out from England to Australia, engaged as medical attendant on board the Ballaarat, and arranged to take out the subject of my sketch, and a younger brother Tom with him. A few days after this arrangement was made Wills came to his father, and with that expression in his countenance so peculiarly his own, said, “My dear father, I have a favour to ask of you. I see my mother is grieving, although she says nothing, at our all leaving her together. Let Tom and me go alone. I will pledge myself to take care of him.” After a consultation this new plan was agreed upon. Dr. Wills released himself from his engagement with Messrs. Simpkins and Marshall for the Ballaarat, and secured two berths for the boys in one of Mr. W. S. Lindsay’s ships, which at that time were conveying living freights to Melbourne, their Channel port of departure being Dartmouth. Wills’s love of knowledge in its details is evidenced by a story told by his father of him at this time. “I found,” he said, “that William had shortly before sailing expended some money on a quantity of stuff rolled up like balls of black rope-yarn, and exclaimed with astonishment, ‘In the name of goodness, are you going to chew or smoke all the way to Australia? '” for the commodity was the good old pigtail tobacco. He said smiling, “This is to make friends with the sailors. I intend to learn something about a ship by the time we reach our destination.” His mode of proceeding, as he told his father, was first to secure the good graces of the crew through the persuasive medium of the pigtail; then to learn the name and use of every rope, and of every part of the ship’s tackle from stem to stern. He thus soon acquired the art of splicing and reefing, and was amongst the first to go aloft in a storm, and to lend a hand in taking in topsails. In 1860 an expedition was organized by the colony of Victoria for the exploration of Australia, and to ascertain the nature of the interior of the great continent, which was then a sealed book; for up to that time the efforts towards exploration had been confined to lonely wanderings through the outer boundaries of the unknown continent, and opinions varied as to whether the interior was a vast inland sea, as Oxley and the first of the explorers believed, or whether it was a stony desert unfit for man and beast, as Sturt concluded. Mr. Ambrose Kyte, whose name was, however, concealed from the public at the time, offered £1,000 as an inducement to the Government and others to come forward and raise funds for the exploration. Parliament voted £6,000, and subscriptions from the public raised the fund to £9,000. A Committee of the Royal Society undertook the superintendence of the arrangements. Twenty-four camels were imported from India with native drivers, and provisions and stores for twelve months were provided. After considerable delay the choice of a leader fell upon Robert O’Hara Burke. He was forty years of age, an Irishman from county Galway. When quite a youth he served in an Austrian cavalry regiment, and subsequently in the Irish Constabulary and the Police Force of Victoria; possessing bravery and dauntless courage, he had no special aptitude or scientific training to lead such an Expedition. He was enthusiastic and impulsive but was unfortunately without the indispensable experience of a seasoned bushman. The appointment of second in command fell upon Mr. G. I. Landells, who owed his preferment to the circumstance of his having been employed to bring the camels from India, an appointment, however, which, as the sequel shows, was a most unfortunate one. Wills, who by this time was a seasoned bushman, with great powers of endurance, tendered his services as astronomer and guide without thinking of any distinct post of command, his object being exclusively scientific. Dr. Ludwick Becker was appointed naturalist and artist, Dr. Herman Beckler as botanist and medical adviser. Ten white men, among whom was John King (a private soldier) and three sepoys, were appointed to accompany the Expedition. The explorers left Melbourne on the 20th August, 1860, amid considerable enthusiasm; nearly the whole population suspending ordinary business, and turning out to witness the start. The mayor of Melbourne publicly addressed them, and wished them God-speed, and through the settled districts their progress, which was slow, was a kind of triumphal march. The route marked out for them was to strike the river Darling, then the lower Barcoo (Cooper’s Creek), and from that point to go northwards to the Gulf of Carpentaria. Swan Hill, on the Murray, which, properly speaking, was the northern boundary of the colony of Victoria, was reached on September 8th. At Balranald, beyond the Murray, Burke found it impossible to get on any longer with his foreman (Ferguson) and discharged him. He had, however, no sooner rid himself of this troublesome man than Mr. Landells, his second in command, began to sow dissension, and to exhibit insubordination in an unmistakable manner. This reached a crisis by the time they came to Menindie, on the Darling, and after a violent scene Landells resigned, returning to Melbourne full of violent complaints against Burke, and Dr. Beckler was foolish enough to follow Landells’ example of resigning, on the alleged ground that he did not like the way Burke spoke to Landells. Fortunately for Burke’s reputation a very full account of all that took place was written at the time by Wills to Professor Neumayer, and the committee expressed their entire approbation of Burke’s conduct, an opinion shared in by the general public, as evidenced by the newspapers of that date. Burke, on the resignation of Mr. Landells, immediately promoted Wills to the post he had vacated, which appointment the committee confirmed. Here there was perfect union and reciprocal understanding. Neither had petty jealousies or reserved views. The success of the expedition was their object, not personal glory their aim. The leader had every confidence in his second, and the second was proud of his leader. But Mr. Burke committed an error in the selection of Mr. Wright for the third position in command, without any previous knowledge or experience of his capabilities. In this he acted from his impulsive nature, and the consequences bore heavily on his own and Wills’ fate. Burke sent Wright back to Menindie with instructions to follow him up with the remainder of the camels to Cooper’s Creek, and Wright himself admitted he gave Burke his word to take the remainder of the party out as soon as he arrived at Menindie. This, however, he omitted to do, and unaccountably delayed making any start until the 26th January, 1861, and to this criminal delay may be attributed the whole of the crushing disaster which subsequently overtook the expedition. While awaiting the arrival of the tardy Wright, short explorations of the adjoining country were made, chiefly by Wills, with the view of examining two or three promising routes to the Gulf of Carpentaria. On the last of these trips Wills penetrated eighty miles, and would have gone further, but the men in charge of the camels fell asleep and let them escape, and the return had to be done on foot in a broiling sun of 146 degrees, no shade, and very little water. Impatient at Wright’s delay, and irritated almost to madness in waiting for him, and seeing the time slipping by, Burke and Wills determined to make a dash for the Gulf of Carpentaria while the opportunity still remained to them. Burke again divided his small party, and taking Wills, King, and Grey, one horse, six camels, and three months’ provisions, started on Sunday, the 16th December, for a dash across the continent. Four men – Brahe, Patten, McDonnough, and Dost Mahomet – with six camels and twelve horses, were left at the camp at Cooper’s Creek, which was made a depot, and Brahe placed in charge until the arrival of Wright or some other person duly appointed by the committee to take command of the remainder of the expedition at Menindie. A surveyor was expected to be sent on to assist Wills, and plenty of work was laid out for all until the return of Burke and Wills – Brahe receiving the most positive orders to remain at Cooper’s Creek until this took place, three or four months being named as the possible time of absence. Wills strongly advised a direct course northward for the exploring party, but Burke hesitated to adopt it unless he could feel confident of a supply of water. The more westerly course was therefore adopted at the commencement of the journey; but after a day or two they turned to the east, and scarcely deviated throughout from the 141st degree of east longitude. Wills kept a diary giving a full account of the journey to the Gulf from the start to February, 1861, which contains very interesting details of each day’s progress. The first point the explorers made for was Eyre’s Creek, and on their first day’s journey they came upon a large tribe of blacks, who, Wills says, came pestering them to go to their camp and have a dance, and nothing but a threat to shoot them would keep them away. They were fine-looking men, but decidedly not of a warlike nature. The explorers crossed Sturt’s supposed “stony desert”, and did not find it the melancholy waste or bad travelling they were led to expect. * In the account of McKinlay’s Expedition from Adelaide, in August, 1861, it is mentioned that when he, in the following February, found himself on the Gulf of Carpentaria, dense walls of mangrove barred his way to the shore, and there can he little doubt that it was the same obstacle which prevented Burke and Wills from viewing the open sea. Having thus accomplished the grand object of their expedition Burke and Wills rejoined Gray and King, where they had left them with the camels, and the four proceeded together on the return journey on the 13th February. Wills’ notes on their scamper back to Cooper’s Creek are brief but powerful. An incessant rainfall made the country boggy, and added to their troubles. On the 2nd March, at Salt-bush Camp, they found Golah, the camel which they had been obliged to leave behind on the outward journey. It was thin and miserable, and had fretted at finding itself left behind, but began to eat as soon as it saw the other camels. On 5th March Burke became ill from eating part of a large snake which they had killed, and poor Golah, being completely done up, and unable to come on, even when pack and saddle were taken off, had to be finally left behind. On 13th March it rained so heavily that Wills had to put his watch and field-book in the pack to keep them dry. All the creeks became flooded, and the poor travellers had to seek shelter under some fallen rocks. Their journey was now slow, as they had to keep on the stony ridge instead of following the flats, which were very boggy owing to the rain. On the 20th they commenced to lighten the loads of the camels by leaving 60 lbs. weight of things behind. Rain continued to fall in torrents, and the ground they passed over was at times either full of water or covered with slimy mud. The names given to some of their camps by Wills – viz., “Humid Camp”, “Muddy Camp”, “Mosquito Camp”, show some of the trials they had to encounter. Gray, who had been complaining of dysentery, stole some of the flour, and was punished by Burke. Five days after this (March 30th) the camel Boocha was killed for food at a place which by gentle irony they called “Boocha’s Rest”; and on the 10th April the horse, which was reduced and knocked up from want of food, was killed also. Down to the 17th nothing very noteworthy is recorded. On that day – the beginning of the end – Wills records the death of Gray, whom the others had thought to be shamming. The survivors sorrowfully buried him in the lonely bush: they were so weak that it was with difficulty they could dig a grave sufficiently deep to lay him in. After a day’s delay to rest their wearied limbs they pushed on, but in a most exhausted state, straining every nerve to reach the goal of their arduous labours, their legs almost paralysed, so that it was a trying task to walk a few yards. Four days afterwards they were cheered by the sight of the familiar landmarks of their old camp at Cooper’s Creek. King describes in vivid language the delight of Burke when he thought he saw the depot camp. “There they are!” he shouted. “I see them.” But, alas! the wish was father to the thought. There was no one there. Lost and bewildered in amazement, he appeared like one stupefied when the horrible truth that the camp had been deserted burst upon him. He was quite overwhelmed, and flung himself on the ground broken-hearted. Wills looked about him in all directions, and presently turning to King said, “They are gone”, and pointing a short way off added, “There are the things they have left.” Calm and quiet as ever, he never once, as King testified, showed the slightest anger or loss of command of himself. “Depot No. 2, Cooper’s Creek Camp, 65. “The return party from Carpentaria, consisting of myself, Wills, and King (Grey dead), arrived here last night and found that the depot party had only started on the same day. We proceed on to-morrow, slowly down the creek towards Adelaide by Mount Hopeless, and shall endeavour to follow Gregory’s track; but we are very weak. The two camels are done up, and we shall not be able to travel faster than four or five miles a day. Grey died on the road from exhaustion and fatigue. We have all suffered much from hunger. The provisions left here will, I think, restore our strength. We have discovered a practicable route to Carpentaria, the chief position of which lies in the 140° of east longitude. There is some good country between this and the Stony Desert. From thence to the tropics the land is dry and stony. Between the Carpentaria a considerable portion is rangy, but well watered and richly grassed. We reached the shores of Carpentaria on the 11th of February, 1861. Greatly disappointed at finding the party here gone. “(Signed) Robert O’Hara Burke, Leader. By slow stages the doomed explorers moved on day by day through what was little better than a desert. The second and third days they came upon some friendly blacks, who gave them fish. On 28th April one of the two remaining camels got bogged by the side of a water hole, and it being impossible to get him out, he was shot the next day, his flesh providing them with food. On May 7th the remaining camel would not rise even without any load on its back, and after making every attempt to get him up they had to leave him to himself. Burke and Wills then went down the creek to reconnoitre, and fortunately fell in with some blacks fishing, who gave them food and took them to their camp, where they passed two nights. Some days after, being pressed for food, several excursions were made to find the blacks again, but without success. On May 17th, however, King unexpectedly came upon the nardoo plant, the seed of which is powdered by the natives and baked into a cake. This discovery raised their spirits, as they considered that with this food they would be able to support themselves, even if they had to remain on the creek and wait for assistance from town. On 27th May Wills started alone to the depot at Cooper’s Creek to see if any relief had arrived. “We have been unable to leave the creek. Both camels are dead, and our provisions are exhausted. Mr. Burke and King are down the lower part of the creek. I am about to return to them, when we shall probably come up this way. We are trying to live the best way we can, like the blacks, but find it hard work. Our clothes are going to pieces fast. Send provisions and clothes as soon as possible. He suffered much from cold, his clothing was reduced to a wide awake, a merino shirt, a regatta shirt without sleeves, the remains of a pair of flannel trousers, two pairs of socks in rags, and a waistcoat. Wills finding his weakness increasing, it was resolved that Burke and King, as the only chance of saving the party, should go in search of natives, and having collected and pounded sufficient nardoo seed to last Wills for eight days, they constructed a rude shelter of boughs for him, placed water and firewood within his reach, and took a sorrowful farewell of him, Wills giving Burke a letter and his watch for his father, and telling King if he survived Burke to carry out his last wishes. In a postscript to this letter Wills says, “I think to live about four or five days. My spirits are excellent.” On the 29th June Wills made his last entry in his diary, shewing that he maintained his calmness of spirit and resignation to the last. “Friday, 29th June, 1861. — Clear, cold night; slight breeze from the east; day beautifully warm and pleasant. Mr. Burke suffers greatly from the cold, and is getting extremely weak. He and King start to-morrow up the creek to look for the blacks; it is the only chance we have of being saved from starvation. I am weaker than ever, although I have a good appetite, and relish the nardoo much; but it seems to give us no nutriment, and the birds here are so shy as not to be got at. Even if we got a good supply of fish, I doubt whether we could do much work on them and the nardoo alone. Nothing now but the greatest good luck can save any of us; and as for myself I may live four or five days if the weather continues warm. My pulse is at forty-eighty and very weak, and my legs and arms are nearly skin and bone. I can only look out, like Mr. Micawber, ‘for something to turn up.’ Starvation on nardoo is by no means very unpleasant, but for the weakness one feels, and the utter inability to move one’s self; for as far as the appetite is concerned it gives the greatest satisfaction. Certainly fat and sugar would be more to one’s taste; in fact, those seem to me to be the great stand-by for one in this extraordinary continent – not that I mean to depreciate the farinaceous food, but the want of sugar and fat in all substances obtainable here is so great that they become almost valueless to us as articles of food without the addition of something else. We are now, alas ! nearing the end of this ill-fated expedition. Burke and King had not travelled many miles when, on the second day from leaving Wills, Burke gave in from sheer weakness, and died early the next morning. King remained two days to recover strength, and then returned to where they had left Wills, taking back with him three crows he had shot, and nardoo he had discovered, and was shocked to find Wills lying dead in his gunwah, where he would appear to have sunk quietly to rest, but in utter loneliness, a few hours after Burke and King had left him. King buried the corpse with sand, and remained there some days prostrated at the death of his companions, and at being left alone in the vast wilderness. The nardoo running short, and being unable to gather it, he tracked some of the natives by their footprints in the sand, and eventually fell in with a number of them, who were kindly disposed, and so was preserved from the fate of his companions. The Exploration Committee at Melbourne seem by their supineness to have helped on the final catastrophe. Although informed of the criminal delay of Wright at Menindie, they took no steps to urge his departure from there. Dr. Wills, our hero’s father, unable to bear the suspense in the month of June, walked with a small pack on his shoulders, and a stick in his hand, from Ballarat to Melbourne, a distance of seventy-five miles, and his energetic appeals led to a search party, under Mr. A. W. Howitt, being sent out. No one who has read the simple records of this great expedition, with all its blunders – so successful as far as its great object was concerned, but so fatal as regards the precious lives of the explorers – but must admire the character, actions, and quiet heroism of Wills. None of the blunders which led to the disaster which befell the Expedition are traceable to him. Throughout the toilsome journey he maintained his quiet, equable temperament. Loyal to his leader he deferred to his wishes, never complained of or reflected on others, continued and carefully recorded his scientific observations to the last, and laid himself down to die in utter loneliness in the vast wilderness with perfect resignation and calmness, as if he were but falling asleep in his father’s arms; and “his works do follow him”; for they opened up the way to the march of civilization, and have been rich in results. The greater part of the country he explored is now in a state of cultivation, with homesteads containing prosperous settlers in all directions, and so early as 1867 a stage coach was running not many miles from where he and Burke laid down their lives. The testimony of the colonists to Wills was on all sides that of admiration for his devoted heroism, appreciation of the scientific results achieved by him, and deep regret at the sacrifice of his young and promising life. Sir Henry Barkly, the Governor of Victoria, in a letter to his mother, said of Wills: “You may rely upon it that the name of William John Wills will go down to posterity, both at home and in this colony, amongst the brightest of those who have sacrificed their lives for the advancement of scientific knowledge and the good of their fellow-creatures.” Dr. Mueller, of the Melbourne Botanical Gardens, who as a tribute to his memory named a new plant in the Australian Flora Eremophila Willsii, “to record by botany the glory never to be forgotten of the intrepid and talented but most unfortunate Wills”, maintained that it was only by his skilful guidance and scientific talents that the great geographic success of the expedition was achieved. A portion of the city was directed to be thereafter named Wills Street by order of the Governor. A massive obelisk was erected to the memory of the two martyrs in the cemetery where they were buried; and on April 21st, 1866, a monument raised to them by the Victorian Legislature at a cost of £4,000, consisting of a statue of each of these two distinguished explorers, was unveiled by the Governor in Collins Street, one of the principal thoroughfares of Melbourne. The day chosen for the ceremony was the fourth anniversary of the return of Burke and Wills to Cooper’s Creek, and their surviving companion King was present on the occasion, which to him must have been one of mingled sorrow and pleasure. And though more than thirty years have passed since his death Wills is not forgotten in the colony; for only last year one of the colonists from Devon, Mr. Angel, who returned from South Australia on a visit to Totnes, and to his native parish of Littlehempstone, finding the inscription on the memorial becoming obliterated had it renewed on a tablet of white marble let into the granite,* that the coming race may not be unmindful of the patient and courageous life and heroic death of this Devonshire hero, the martyred Wills. * Since this paper was written Mr. F. Horn, marble mason, of Totnes, has executed a successful medallion of Wills, which has been let into the obelisk above the tablet.